With many beauty launches ahead of us this month, and an unhealthy appetite for pretty things (or just being bluntly greedy) making wish lists is what I do all the time. 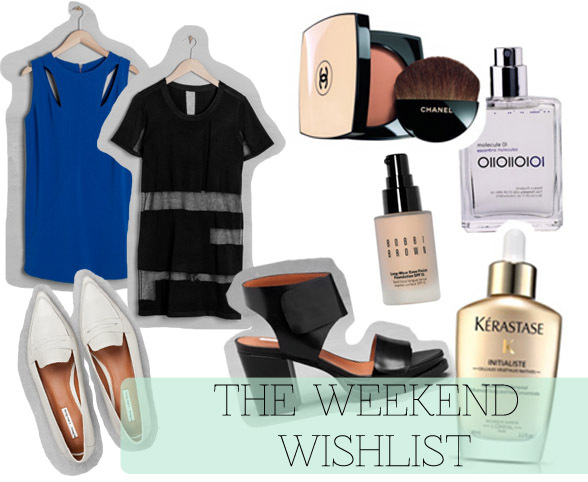 This week on the list a mix of fashion and beauty bits. I’ve been raving about & Other Stories the past week to everyone who was willing to listen, and I just can’t stop. For those that have not heard of & Other Stories yet, it’s a new brand created by the COS and H&M founders – they sell everything from shoes to accessories to ready-to-wear to skin/body care. I can stay in that store for hours, which I actually did… It’s totally my style, and if I have to describe the brand I’d say minimalistic, chic and sophisticated. It reminds me of the likes of ZARA, COS, Whistles, REISS and Acne. The picks I’ve been this week? The Blue Panel Dress, effortlessly chic with a hint of color, the Contrast Knit Dress, Abigail Lorick Loafers – I’m starting to fancy pointy shoes at the moment and the Block Heel Sandals. Look at those babies, they are gorgeous! The sandals are my favorite, and I’ll be definitely putting those on my priority to buy list – every girl needs at least one chunky-heeled sandal. Moving on to the beauty bits, I’d of course have to include this week’s most exciting launch: Chanel Les Beiges powders. Not sure if they are that necessary in my stash, but hey, who can stop me from fancying it? A cult-classic is the Molecule 01 fragrance, I still haven’t gotten to get it as I want to spritz it on myself first before getting it. Haven’t managed to find a store that carries it though… I’ve also been eyeing the Bobbi Brown Long Wear Even Finish Foundation, it contains SPF15 (always a plus) and it’s been dubbed as the Jemma Kidd Light As Air Foundation – which is my all-time favorite and one of a kind in my opinion. I’m having big expectations for the BB foundation! And lastly, Kérastase Initialiste treatment. I’m sure you all know I’ve been struggling with my hair lately and have been suffering from hair loss. From what it says on the net it is pretty amazing, really intrigued. Have you tried any of these products/items, would you recommend them?